This week we are presenting a three-part series highlighting the history of graduation at the University of Oregon. Part one (Tuesday) takes a look back at commencement ceremonies from the the 19th century, part two (Wednesday) features a recent donation of graduation memorabilia, and part three (Thursday) highlights commencement speeches over the years. Congratulations to the Class of 2015!! On Monday, June 15, the University of Oregon will host the Duck Walk from Johnson Hall to Matthew Knight Arena in the lead-up to the 138th annual university graduation ceremony. From 9:30 to 11:00 am, the ceremony will honor the commencement of studies and the conferment of degrees for over 4000 students. In addition, 41 schools of the university will hold departmental ceremonies across campus throughout Sunday and Monday, affording a more intimate setting to recognize students within their major. The Class of 2015 continues a tradition of grandiose commencements held at the University of Oregon. 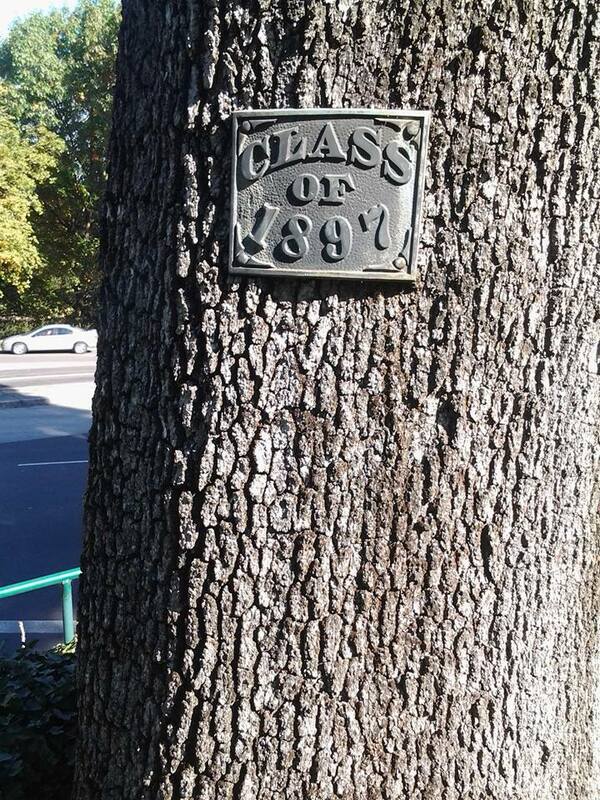 Today we will take a look back at the graduation ceremonies of the 19th century, putting in perspective the modern festivities with the earliest classes who celebrated the culmination of their time in Eugene. On June 14, 1878, six hundred people congregated in the auditorium space that then comprised the top floor of Deady Hall to celebrate the first commencement ceremony at the University of Oregon. Student orations were followed by an address by Judge Matthew P. Deady, the president of the Board of Regents and the man for whom the original campus building would come to be named. Then five students — John C. Whiteaker of Creswell; George S. Washburne of Junction City; and Robert S. Bean, Matthew S. Wallis, and Nellie A. Condon of Eugene — concluded their course of study in Eugene as they were bestowed with the inaugural diplomas presented by the university. These graduating students invested considerable sums beyond their enrollment to obtain their diplomas. In 1880 students spent $20 each — the equivalent of over $480 today — for the receipt of diplomas inscribed upon sheepskin vellum. 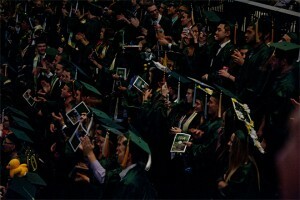 By the second decade of the University of Oregon’s existence, commencement had become one of the two most lavish celebrations on the annual Lane County social calendar along with Independence Day festivities on July 4. Both the campus community and the citizenry of Lane County in the 19th century celebrated through a full week of speeches, banquets, services, and other events that wrapped up each academic year. The week began with a Baccalaureate Sunday service in Villard Hall. It was the only morning church service held in Eugene on that Sunday each year, leading the populace to arrive early to claim seats. Both local ministers and spiritual leaders from around the state attended the event, leading the congregated citizenry in prayers. The devotional service commenced a week that included concerts by the School of Music, intramural athletic competitions, receptions and orations, and the annual Class Day that included the tradition of installing a senior gift on campus. 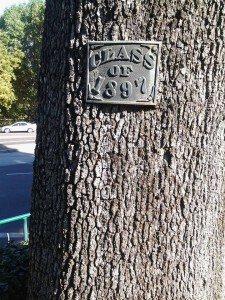 For the first 19 years of graduation, each class planted a tree as a lasting legacy of its time on campus, until the class of 1897 instead installed a plaque on one of the oaks already growing on campus. After this initial deviation, each succeeding class has been more flexible in the senior gift it presented to the university. Of course, during this period of the university’s history both the campus and the student body were much smaller. The average graduating class contained just 12 students, with a total of 283 (168 men and 115 women) receiving degrees between 1878 and 1900. 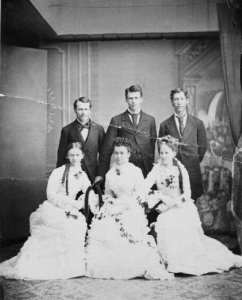 Beginning with Nellie Condon in 1878, every class but one — the eight-man graduating class of 1892 — has included a woman among its graduating students. The small size of classes allowed for unique traditions to develop that were still manageable to maintain during this period. Among them were the exchanging of photographs between every member of the graduating class. “The time-honored custom,” the Oregon Monthly noted in its June/July 1897 issue, “was complied with and each member of the class has a lasting souvenir of every member.” Before the printing of the first yearbook in 1901, these photographs provided a visual reminder for alumni of their peers at the university. The thousands of students that will be feted this weekend, it seems, enter the next phase of their lives with no less uncertainty or nostalgia than the generations of alumni that came before. Even as everything has changed in the details of commencement ceremonies on campus, the sentiment behind them remains forever the same. “Alumni,” in Seventeenth Annual Catalogue of the University of Oregon 1892-1893 (Eugene: 1893), 41-44. Leland G. Hendricks, “Historical Sketch of the University,” in 1915 Oregana, ed. Leland G. Hendricks (Eugene: University of Oregon, 1914), 10-16. Laura Miller, “The Old-Fashioned Commencement,” Old Oregon 5, no. 9 (June 1923): 1-4. “Commencement History,” University Archives alphabetical subject files, UA Ref 1, box 5, Special Collections & University Archives, University of Oregon Libraries, Eugene, Oregon. Data for table compiled from Alumni Association, Alumni Directory of the University of Oregon 1878-1925 (Eugene: University Press, 1925). Photographs from UO Archives Photographs, KVAL.com, and the author. This is excellent and helpful material. In his MA thesis, PH Overmeyer, quotes from Oregon Federal District Judge (and UO Bd of Regents Pres.) Matthew P. Deady’s famous “TO BE OR TO HAVE” Commencement address of 1878, I believe. It is a stirring and famous,at the time, address–worthy of reading and quoting. Deady made many Commncement addresses at the UO during his 1876-1893 UO Bd of Regents Pres. tenure.